So this coming week we’re taking our first big family trip together. I can’t believe that sentence is actually true since it seems like between Tyson and I, we’re always on a plane, or at least traveling with one of the kids separately. We’ve taken road trips together of course, but I’m just now realizing we haven’t actually been on a plane ... all together ... ever. I find it fascinating that we have no experience with this, and yet have chosen to make that inaugural flight with them 10 hours long haha. Is it obvious that we bought the tickets at 1AM? ANYWAY. Our overall excitement for the trip is through the roof. We’re going to London and taking the kids to Peppa Pig World (yes, that’s a thing) and Legoland. They don’t entirely know that we’re going yet, so we’ll surprise them the morning of, but I’m pretty sure they manifested this trip with their belief in it alone because they haven’t stopped talking about how they’re definitely, one-hundred percent, absolutely, for sure going to Peppa Pig World and Legoland ... for at least a year now. 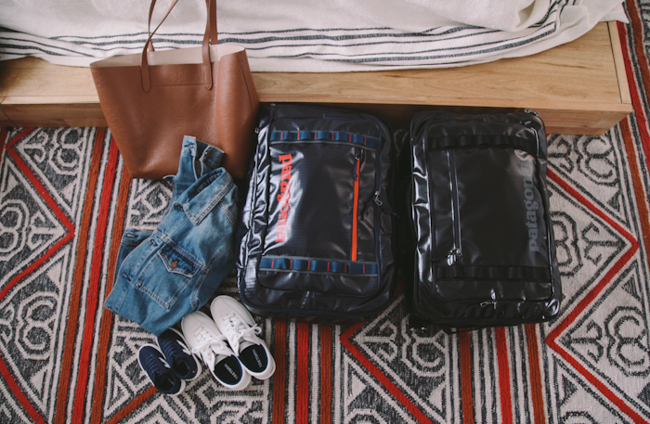 And to make things even more interesting … we’re only bringing 2 carry-ons. Oh yes. The plan is to take one pair of shoes each, to be worn on the plane, as well as whatever jackets/layers also be worn on the plane. And then we’ll bring a select few versatile outfits, toiletries, a little detergent, and praise everything (!) zero diapers. 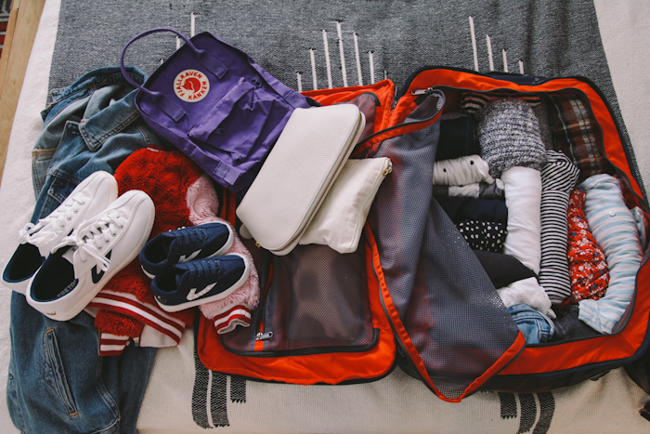 And then the kids will each have their own little backpacks for plane activities and snacks … is it crazy to say that I feel like this is going to be pretty easy to pull off? I can be a minimalist when I want to be. Typically what takes up the most space in my luggage is my toiletries. Between my hair and my skin care routine - BOY HONEY. If you guys saw my skincare routine on my instastories (now saved to my profile), then you already know I’m going to have to get real selective. 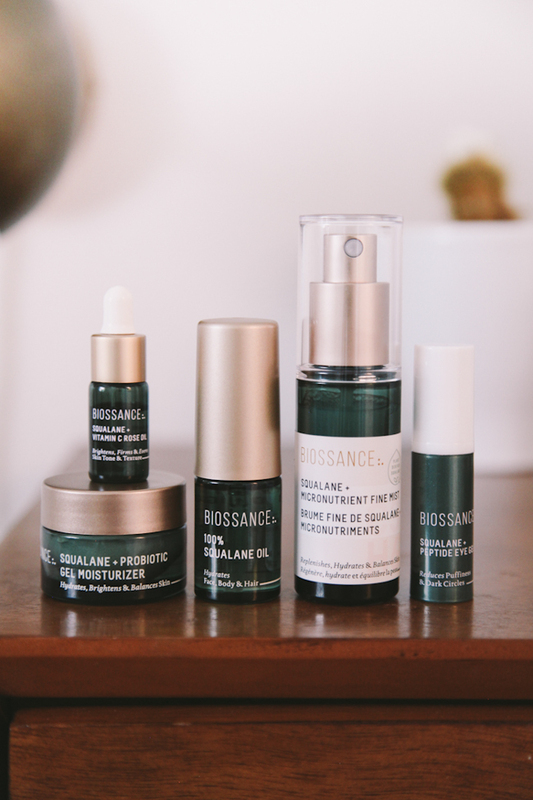 It’s no secret how big of a fan I am of Biossance products, I’ve used them for years, and love that they’re a clean beauty brand that actually produces real results. So. 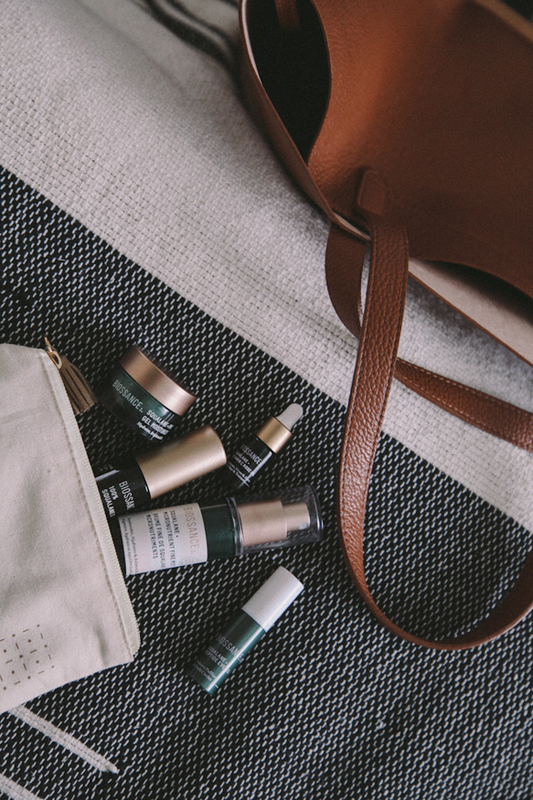 LUCKY FOR ME, I just found out that some of my favorites now come in the best little travel sizes (will be packing some free samples too!) so I don’t actually have to give up that much while trying to keep the packing to a minimum. Because everything we want to do is pretty spread out across the UK, we wanted to make the day-to-day train travel as light and easy as possible so that we have our hands free. I was totally inspired by several posts I read on the ability to travel minimally as a family, and because we’ll already be bringing two strollers, a camera bag, and then all the snacks/entertainment for our long travel days, I thought the convenience of very little luggage sounded like a complete dream. My husband LIVES for efficient/ compact packing and so as soon as I told him that I, for the first time in my over-packing life, wanted to give it a try, he immediately dropped to his knee and proposed again. And then spent the next 98 hours watching carry-on bag reviews on YouTube. Last year, I got a preview of their new Squalane + Micronutrient Fine Mist at Biossance HQ and totally fell in love. And now here it is in TRAVEL SIZE and I’m totally geeking out. I always, always spritz this on right after doing my makeup or if I need to freshen up after a flight. For my moisturizing step, I pretty much always use the Squalane + Probiotic Gel Moisturizer and the Squalane + Vitamin C Rose Oil in combination with each other. They are my FAVORITES. And I use the free sample sizes as travel sizes, so if you wanna do the same or just try these two together for only $5 shipping, you totally can! Highly recommend! You can also try their Squalane + Peptide Eye Gel in the same free sampling program. I’ve tried several different eye gels, and they’ve historically been pretty harsh on my skin, but I have LOVED this stuff. Because it’s somehow powerful, yet still perfect for sensitive under-eyes. I was also so stoked when they started offering their signature 100% Squalane Oil in travel size because I mainly use this on my hair to tame its naturally frizzy tendencies. Which is key when you’re in the middle of an internal debate about bringing your curling iron. I’m actually excited to travel like this! Despite my BFF Taylor being completely beside herself that I would deliberately choose to not bring more fashion options for London, because hello, it’s London. But LIKE I SAID … we’re going with highly curated haha. I’ll let you know how it goes. I'm so intrigued by this! 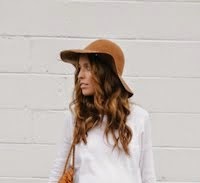 I totally think you can do it, kids clothes are itti-bitty.☺ Full is in on everything! And have fun! I love your outfit! Can you share where the pieces are from? Also, that's so awesome that you have figured out how to pack so minimally; I've always wished I could get there.